Ten easy miles arounf Sugar House. Perfect morning. 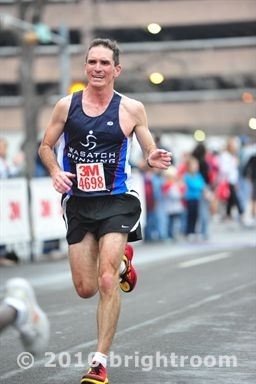 Every time I see a picture of myself running lately, I look like I'm running flat footed with a shuffle stride. I definitely don't have the springy stride of a 30 year old. I'm going to focus on minimizing ground contact time. Toured the state capitol with Andy this afternoon doing Utah history stuff for Cub Scouts. They have the Nike Cortez running shoes Forrest Gump wore in his runs across America which ended in Utah's Monument Valley. Abby went to high tea at the Grand America with a school friend. After dinner tonight, Ann and I went for a walk and every time we came in the couse Abby told us that we had to walk some more because she was getting something really special ready for us. So when we finally finished, we had tea, yogurt with fruit, and finger sandwiches. She dug out all our serving trays we never use and had candles. Fun. She was really proud of herself. Two miles easy and 20 times up and down the stadium steps. Walk around the neighborhood when I got home. A little insomnia led to a great morning run. I woke up at 3 AM and couldn't go back to sleep. So I switched on the coffee maker, scarfed down a Cliff Bar, and headed out at 3:50. 13.25 miles in 1:45. PM: 2 miles at track practice. Apparently one of the many benefits of coaching track at Alta High these days is a free pair of shoes courtesy of the school. So I swung by Wasatch Running on my way home and picked up a sweet new pair of Saucony Rides. Got home and did ten miles around Sugarhouse in the rainywindy. Loved the shoes! They're my new favorites.